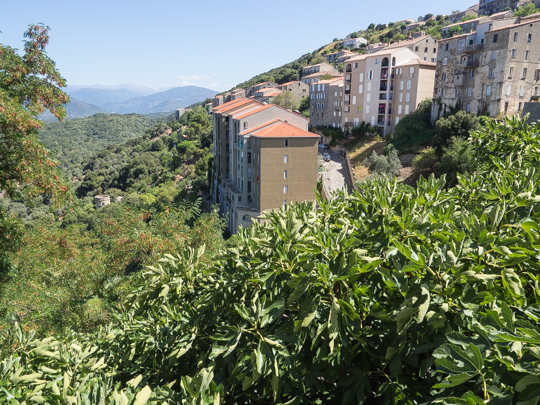 This is the second installment of my posts detailing my Corsica & Provence trip this summer. 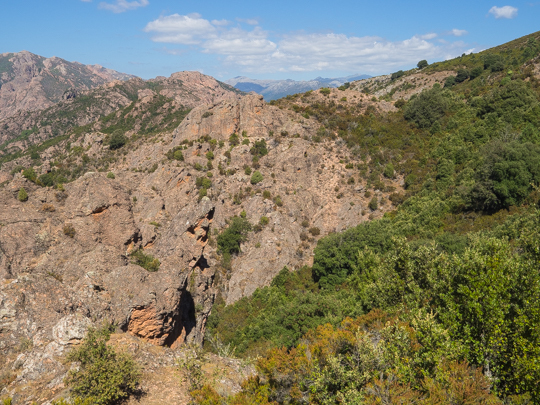 In the second leg of our trip, after our stay in Bonifacio, we explored the mountains of central Corsica. 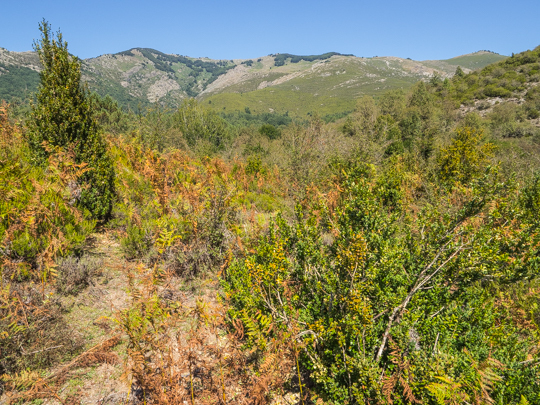 We spent one night in the foothills outside the capital city of Ajaccio, on the western coast, and then two nights just east of Corte in the heart of central Corsica. After leaving Bonifacio, we drove a bit over an hour then stopped in the historic town of Sartène for lunch and to explore the old town. It’s a quick but worthwhile stop between Bonifacio and Ajaccio. The tourist office in Sartène gave us a map that guided us along a loop of picturesque villages starting on the D19 from Propriano. We spent the night about 15 kilometers from Ajaccio at Domaine des Trois Roses. This guesthouse is not easy to find, even with the directions provided. They could use a sign out front! But once we found it, we were happy. The rooms are comfortable (though a bit hot in summer) and the pool is fantastic. 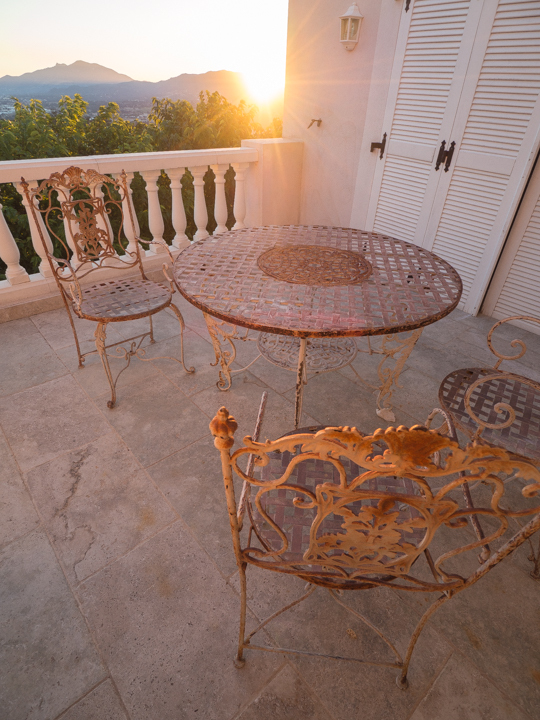 The guesthouse has a low-key atmosphere—you feel that you are just houseguests of Marie Claude, who is very welcoming. 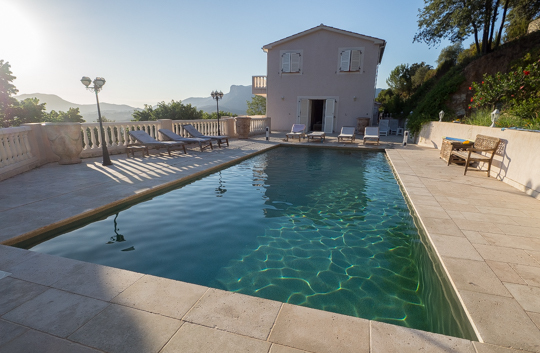 Marie Claude, our host at Domaine des Trois Roses had booked us at nearby restaurant, A Casetta, that was fantastic. It’s a bit on the fancy side but well worth the slight splurge. The next day, we stopped in Corte for lunch and some exploring. 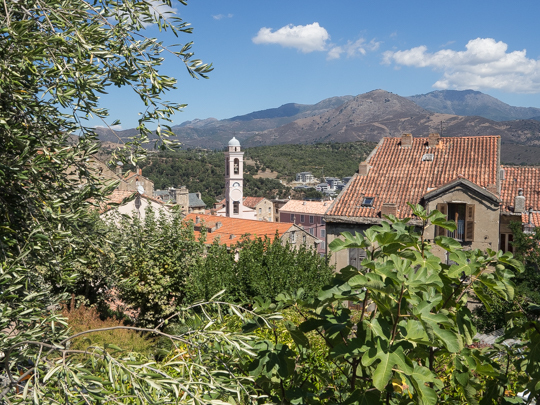 Corte is the main city in Corsica’s mountainous center and makes for a stop. 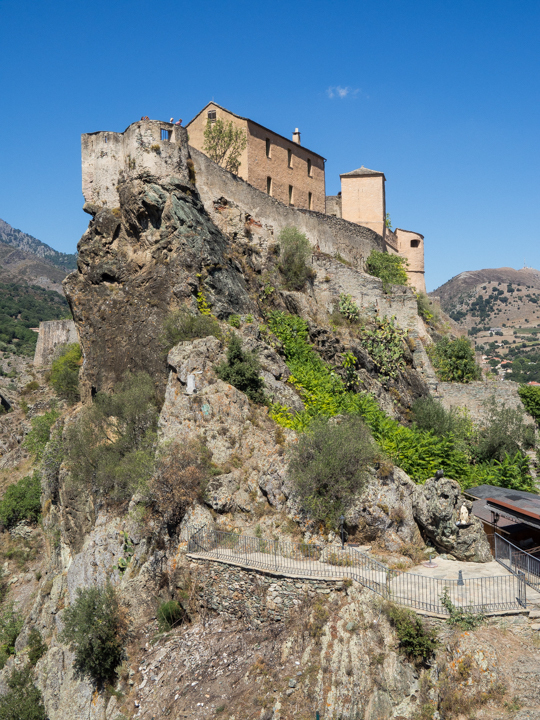 It’s well worth walking up the hill for views of the Citadelle perched on the top of a rock outcropping. We spent the next two nights at Casa di Lucia, one of the most memorable guesthouses I have stayed in. 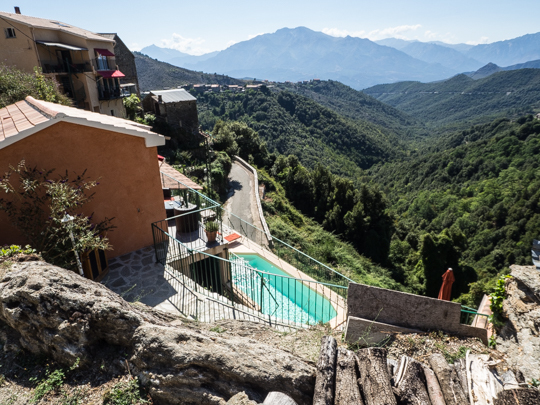 The drive up into the mountains is only for confident drivers (I have no idea how you’d get there in the snow and Casa di Lucia is open year round!) but it’s well signposted. 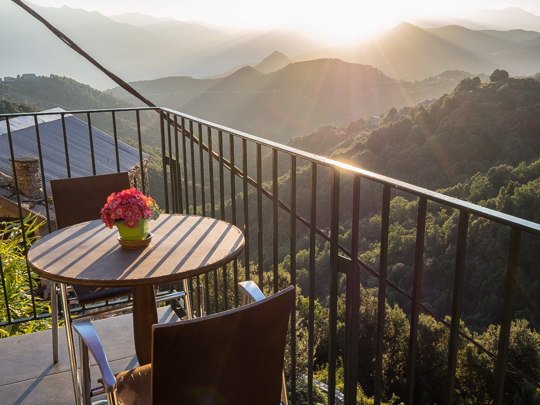 Our room was a creatively decorated suite with a balcony looking out over the mountains. 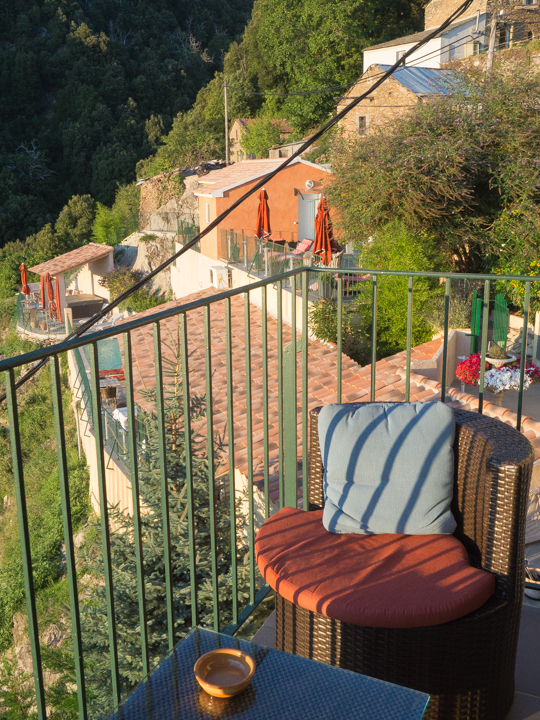 The guesthouse and the pool are perched on the side of a steep slope and the views are magnificent. The pool gets great afternoon sun and the restaurant shares the same view across the valley. The owners have plans to enclose part of the restaurant and expand the pool terrace. I highly recommend eating all your meals at Casa di Lucia—they will even make up a brown bag lunch if you like. The food is incredible and you wouldn’t want to have to drive off the mountain at night anyways. We spent a good bit of time at Casa di Lucia hanging out on our balcony and at the pool and just relaxing. The middle day, we hiked along the Mare and Mare trail that you can catch a mere 10 or so yards from the front of the guesthouse. 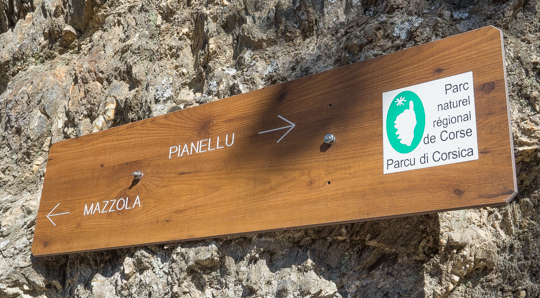 We followed the guesthouse owner’s suggestion and hiked to upper Mazzola, across the plateau and down to the town of Pianello and back. It was about 4-5 hours round trip and a beautiful hike. Stay tuned for the third installment of my Corsica & Provence posts next week! Don’t forget that you can see all my photos from this trip here! Thanks, Mel! You should go!